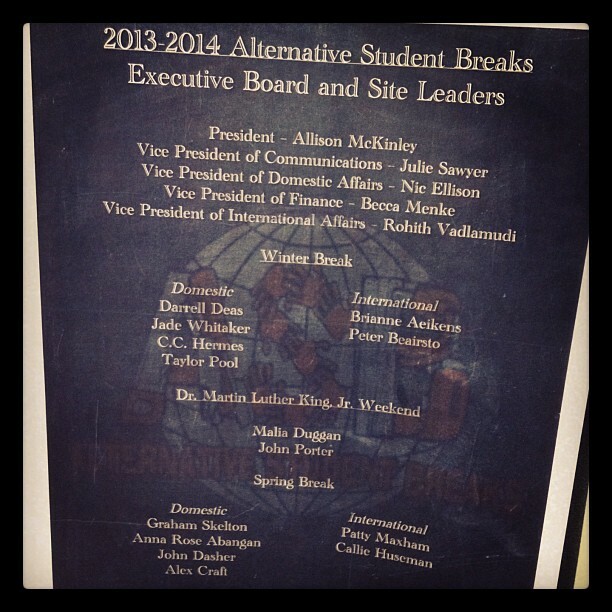 ASB has had a great year thanks to the hard work of our participants and Site Leaders! We’ve sent over 100 students to ten communities across the Western Hemisphere and volunteered thousands of hours. 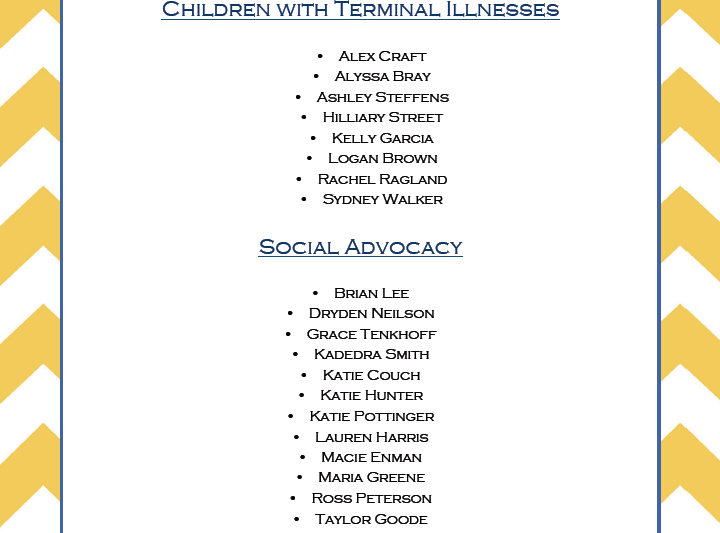 As we transition with our new 2013-2014 Executive Board and Site Leaders, check out the descriptions and links below for information about what issues and communities we’ve partnered with this year! If you want to join us on a trip next year, look out for applications in the Fall semester. We worked in Soddy Daisy TN with the Cumberland Trail Conference on environmental issues. They work on the Cumberland Trail with the Tennessee Trails Association on keeping the trails maintained and forming new trails. Their goal is to eventually have a complete over 300 miles of unbroken trail. In December we worked on the trails, clearing them and building rock walls so that the trails are more accessible. They want to have the trails available to the public so people can see the area around them and understand why they do what they do. ASBig Easy had a great time in New Orleans. We left Auburn Saturday morning as strangers, but by the time we made it to Mobile the bonding had begun (this can be partially attributed to the hour it took us to find a place to eat). We started the night out right with beignets from Cafè du Monde and touring downtown. One group took the opportunity to go to mass at the oldest cathedral in America! Sunday was great! In a span of 8 hours we went to the Audubon zoo, aquarium, and insectarium; we were exhausted. Monday through Friday were spent working in three different homes. Our site leader JP taught us everything from missing to installing doors. Throughout the week we were blessed to hear personal stories about hurricane Katrina’s devastation and rebuilding. On Friday we got a chance to visit Brad Pitt’s homes and see where the levee breached. Our trip was eye opening from every perspective. We learned practical skills for building a house, how to be active citizens by caring for a cause, had a reality check as far as how much devastation nature can cause, and how to build lasting friendships through service. For this ASB trip, we spent a week in beautiful Managua, Nicaragua. The scenery was amazing and the people living in the local community were incredibly hospitable and welcoming. We were able to build a house for a family of seven. The majority of work throughout the week was difficult ranging from mixing concrete to carrying wood and roofing materials up large hills. As a group, we grew extremely close of the course of the week because of the unifying goal of constructing a house for a family in desperate need of a more adequate place to call home. The trip culminated in the completion of the house and we were able to eat dinner with the family in their new house at the end of the week. The trip was a much-needed break from the realities of living in the United States. The people of Nicaragua live a much slower life with a major emphasis on solidarity. The communities are very passionate about developing meaningful relationships with friends and family. Our favorite part of the trip was getting the opportunity to meet the parents and children who would live in the house we built. The children displayed such an enthusiastic and joyful energy everyday that was contagious and heartwarming. We are grateful for the time ASB spent in Managua and relish the possibility of returning to serve the people of Nicaragua. Our trip focused on food insecurity. Food insecurity refers to a household or country’s ability and access to nutritional and safe food that fulfills dietary needs for living an active and healthy lifestyle. The World Health Organization defines the three facets of food insecurity as food availability, food access, and food use. We partnered with Project Open Hand, a nonprofit organization that provides nutritional and dietetic services along with nutritionally appropriate meals to elderly individuals and individuals with or at risk for chronic illnesses. My participants and I served in Atlanta, Georgia over MLK weekend. We volunteered on Saturday and Sunday and thoroughly enjoyed working with everyone at Open Hand Atlanta. My participants and I had a wonderful experience and came back to Auburn with greater awareness of this serious, but solvable, issue. We also returned to Auburn with a much greater appreciation for life in general. A few of us had the tremendous opportunity to deliver meals directly to clients; I can honestly say this has been the most fulfilling work I have ever done. Many of my participants’ favorite aspect of the trip was the direct impact they made on thousands of lives in the Atlanta area. We were able to help prepare and package meals, in addition to deliver the meals, so it was rewarding to see both parts of their operation and see an immediate effect from your volunteer efforts. Our trip went to San Cristobal in the Dominican Republic. We worked with community development and economic poverty while we were there. We staffed medical clinics, distributed care packages at a refugee camp, and helped out at a local orphanage. Appleseed Expeditions partnered us with a missionary family with whom we stayed and worked with throughout the week. Outside major population centers, emergency and general health care service range from extremely limited to non-existent. The standard of quality and care is often poor in public run hospitals. Most of the population ranges from working to poor peasant class; many of whom live in absolute poverty. Also, many of the orphans end up in prostitution/human slavery or become hardened criminals. Our trip went to Cranks Creek, Kentucky, a small, rural town in Eastern Kentucky home to many people living in extreme poverty. Harlan Country, where Cranks Creek is located, has been designated one of 40 economically distressed counties in Kentucky by the Appalachian Regional Commission, so there is a clear need in the area. We volunteered with the Cranks Creek Survival Center, a small organization whose goal is to help fill the needs of the people of Cranks Creek and the surrounding area. Cranks Creek Survival Center has had groups of volunteers from all over the country and even international groups come to stay and work with them. We didn’t know exactly what we will be doing until we arrive, but it could be anything from building a handicapped ramp to fixing a roof. For five wonderful days, I had the humbling pleasure of taking my peers to volunteer at Give Kids the World. Located in Kissimmee, FL, GKTW is a partner of Make a Wish Foundation. When children and their families visit Florida’s theme parks as part of their wishes, GKTW houses and feeds them for free. As volunteers, my group helped serve these families in multiple capacities, completing tasks ranging from food service, to operating giant carousels, to dressing up as Pirates and Princesses to help propagate the magical experience of Disney. Despite being the ones doing the serving, we undoubtedly were the ones that benefited from this trip. Meeting the children and their families on Monday and watching them interact and have fun throughout the week was a powerful experience given the severity of the children’s situations. Watching my closest new friend, a little boy stricken with leukemia, run around and laugh for the first time in months put my life in perspective. Departing from them on Friday was an emotional experience for all involved. Upon returning to Auburn, members of our trip have shown a great interest in prolonging our service mentality. As Bill Murray states in the film ‘Scrooge’ when talking about giving to others, “you become greedy for it.” You may think we are involved to help others, but, in actuality, we are just being selfish. Serving our Spring Break in Apopka, Florida this past week was truly an eye opening experience. We worked directly with the Hope CommUnity Center, a relief ministry for immigrant workers and their families. We spent the week immersing ourselves in the lives of migrant workers, physically living with families in the area and learning about relevant issues regarding immigration policies and reforms. Each morning, we participated in various activities including packing potatoes for needy families and working side by side with migrant workers in the nurseries. On Thursday, we even got an opportunity to observe a march in the support of the Coalition of Immokalee Workers’ Fair Food Compromise. It was truly a unique opportunity for us to see such an organized and positive social movement. Also, we were able to spend an afternoon with the center’s youth group which was comprised of the most positive and friendly teenagers I have ever met. Their passion and stories about the Apopka immigration community was extremely inspiring and powerful to listen to. Without a doubt, our favorite part of the week was spending time with our host families and learning their personal stories about transition into United States culture. After spending a week immersed in their lifestyles, we all left completely changed and full of compassion for the families that welcomed us into their homes. 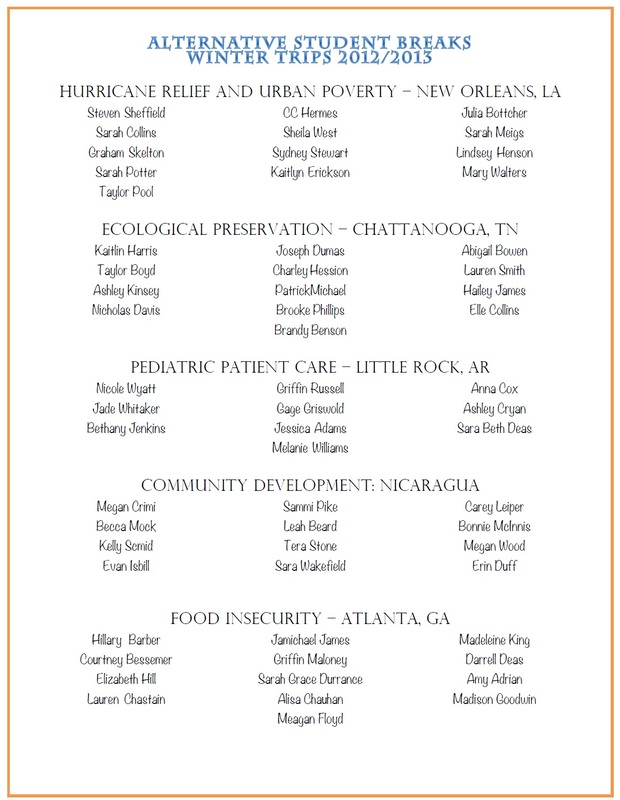 Congratulations to our Spring 2013 participants! We are so excited to meet everyone at the first winter training on November 11! 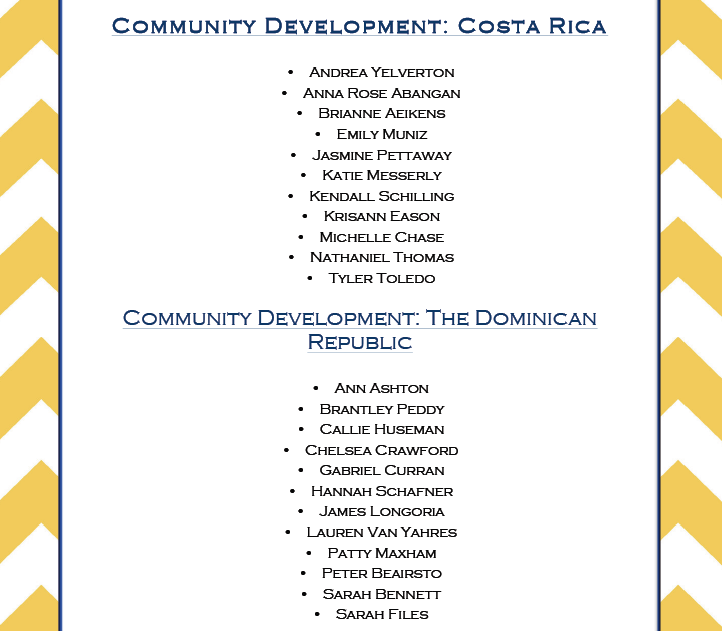 Congratulations to all of our winter participants! We are so excited to meet everyone at our first winter training on September 23. 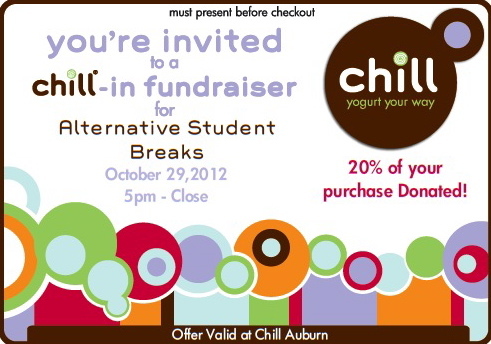 Stayed tuned for spring break applications- those will be available October 15! Winter 2012: Interest Sessions This Week! We will be having two interest sessions this week about our Winter Trips. Join us on Monday, September 10 at Zoes Kitchen at 7PM or on Tuesday, September 11 in the Student Center in room 2216 at 6PM. We will talking about all of the trips and answering any questions you may have. 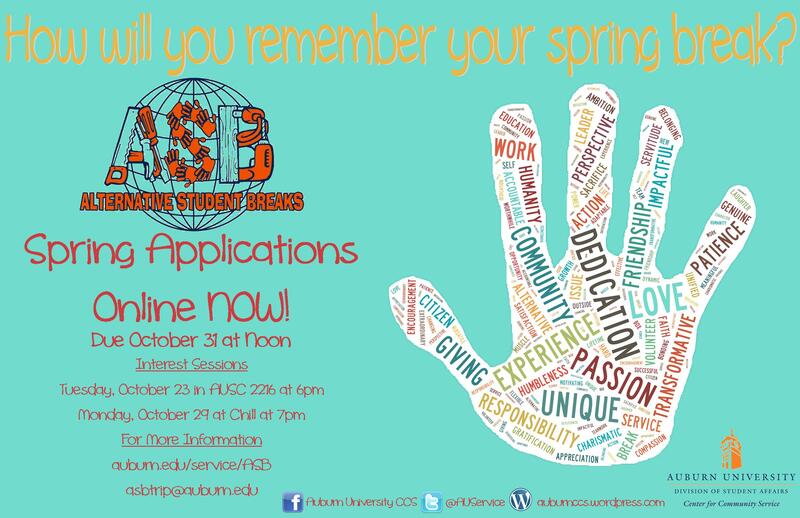 Don’t forget applications are due Wednesday, September 12 at noon!